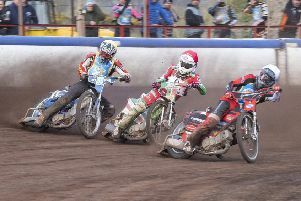 Sam MASTERS’ rapid rise to the coveted No.1 spot in the Edinburgh Monarchs speedway team after just a few weeks of the new season has taken nobody by surprise. The smiling Australian laid the foundations last year with a splurge of high-scoring displays which eclipsed, on occasions, the efforts of Craig Cook, the man he has now displaced. Masters’ consistency during Monarchs’ history-making treble-winning campaign has continued almost seamlessly into 2015 and Cook, who continues to have issues with his clutches, may find it hard to climb back to the summit. Masters, who lines up against Newcastle Diamonds in tonight’s Premier League fixture at Armadale, confessed he is something of a reluctant top dog and never set out to elbow his team-mate out of the role. But statistics don’t lie and under the first set of new averages, Masters’ prowess on the track makes him leader of the pack for now. He said: “I did not aim to be No.1 and always said that if people asked the question. “Craig is such a good rider and has been awesome round Armadale. But my consistent scoring has carried on from last season and that’s the reason. Masters says there is no great secret behind his ascendancy, explaining: “It boils down to the fact that I did a lot of racing during the winter back home in Australia, probably far more than I have done in the past. Masters is already shaping Monarchs’ defence of their championship title, and said after their 50-40 victory at Scunthorpe Scorpions on Monday that the signs are positive for another rewarding season. The Diamonds have also undergone a switch to their riding order, with Lewis Kerr occupying the No.1 slot, swapping places with Stevie Worrall, who was such a lucky talisman for Monarchs at reserve in 2014. Worrall drops to No.3, maintaining his partnership with another former Monarch, Christian Henry. Monarchs continue to use the rider replacement for injured Erik Riss, which gives extra outings to Max Clegg, Rob Branford, and in-form Kevin Wolbert, who was Monarchs’ top scorer at Scunthorpe.